This is my dining room table and chairs. As you can see, it’s a little bonkers with pink legs. It is also completely impractical for more than 2 folk as the side legs are in the wrong place. Not sure where side legs should be, but certainly not where these are. You feel a little as if you are fighting for space and comfort when sat there, and if it’s me there, my jaw clamps and my enjoyment levels plummet. Four people will start to get irritated with each other, more than that and there is likely to be an emergency room visit required, before the mash potato arrives. It seats in a nice spot . . . but is never used, and not only because of the points above. I’ll raise my hand here, I don’t like it. Simple as that. Why not get rid of it? Hmmm, talk to the hubby. He loves that table more than me I think! Kidding . . . I hope. We actually bought this table years ago, it was a horrible colour and moved from the kitchen to outdoors where it suffered the perils of bad weather, until we had it refurbished to its current state. My interest in sharing this then is down to a story I heard over the weekend regarding the dining room table, and how it’s changed over the years, not only in position but family life itself. You’d think a table would be fairly insignificant, but actually the story had me nodding my head in agreement. As it seems the demise of the dining table can be cited as one of the reasons why family communication and want-to-be-together has broken down. \We no longer it appears feel the need to be as one. No more are the family unit pleased to be in the same room, eating and talking and enjoying, at most an hour together once a day. How much can be achieved in that time must be huge, even if it’s about being aware of other’s likes, dislikes, while allowing questioning and answering on any subject, from world peace to Uncle Bert’s bunion op. The conclusion then was based on how the dining table over the last 5 or 6 era’s has moved from being in an allocated room used for Sunday lunch, to a table in the kitchen, to a table in the living room close to the TV, to an open plan kitchen with an eating surface and bar stools and no further table, to no table, no kitchen eating area, eat in front of the TV. In essence, once the TV took over, so family structure began to fall away. It’s a shame isn’t it? Now I say this reservedly as I can well remember as a child having to sit at the dining table on a Sunday for the obligatory roast. The meal was always superb, and I still picture the puddings and jug of custard arriving to this day. I don’t recall conversations all that much, but I know we had to sit there until everybody had finished, and then only once we’d asked to leave, could we. I said reservedly as the sitting there bit used to really get up my nose. However, now, all grown up with no functional table to speak of, I appreciate the time we had there, and how it brought us all together, even if this was only for a couple of hours a week. We were a family of six, here’s us four children. 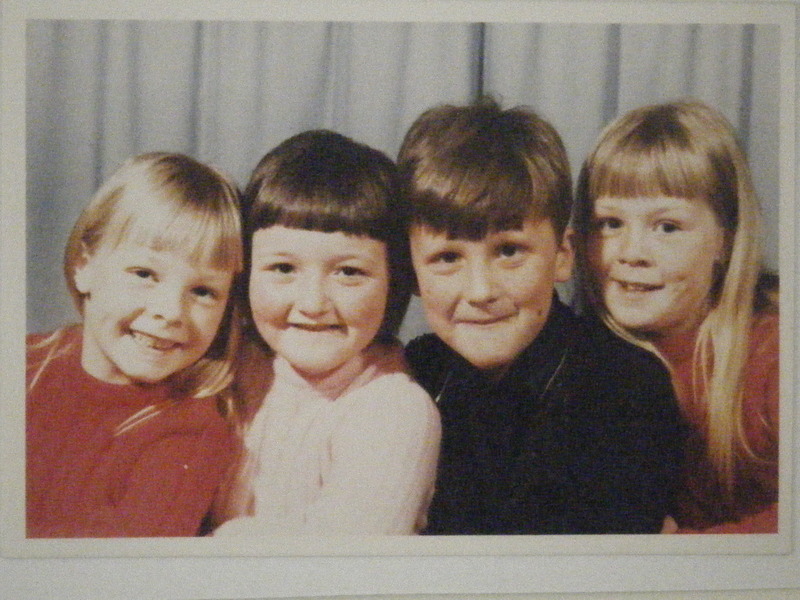 Gosh we were funny looking, err, sorry, we were really cute. Jokes aside this is one of my favourite photos of all time. I wish I could share tales of falling of chairs with mirth as we squabbled over the last roastie, or arm wrestling for the last slice of lemon meringue, but I can’t. Maybe one of my siblings will remind me. So what do you think, a break down of society due to the omission of dining table? And indeed, do you still use the dining room table, and what is yours like? 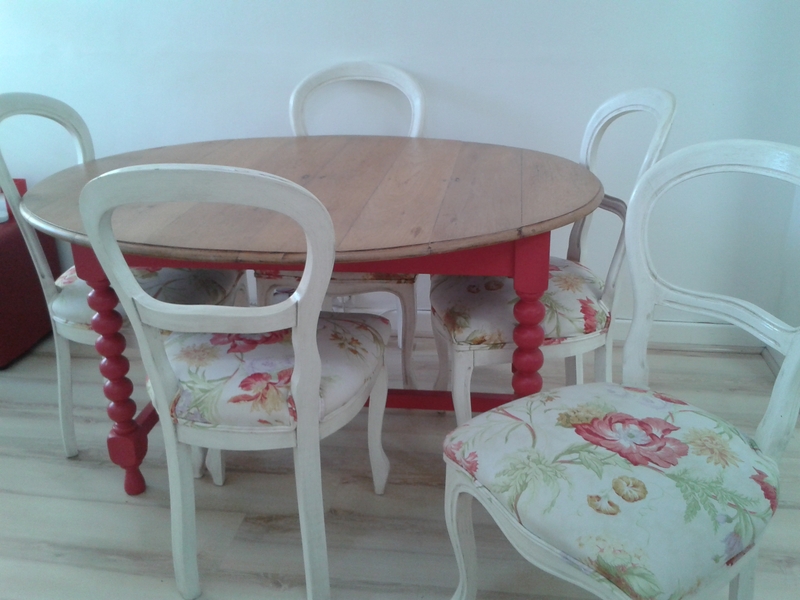 I no longer have space for a dining table in my retirement cottage, but my previous ones have ranged from an 8-seater rectangular table to a 4-seater pine table and then a 4-seater round table brought back from Holland. I agree that TV killed the social occasion that mealtimes used to be.